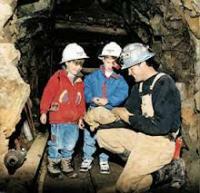 What To Do > Colorado > Breckenridge Summit County > Activities > Country Boy Mine - Explore 1,000 feet under a mountain! Explore the original workings of the Country Boy Mine and experience what it was like to be a Colorado Miner over 100 years ago. Pan for gold in the Eureka creek or in the cozy, restored Blacksmith Shop building. Examine old photographs, pet the roaming burros, and "Shoot the chute": slide down the 55-foot ore chute slide! Fun for the whole family. Come and tour the only underground gold mine in Breckenridge. Open year-round. Activity - Explore 1,000 feet under a mountain!